Cyon:Veritas by C. V. Manning (2005, Softcover As N)Book ConditionFrom the Inside FlapSoftcover is Like new but has very modest shelfwear to the edges. The pages are tight, crisp and clean. Inscription from the author on the FFEP. "Forest It's a dogs life Enjoy! Clyde"pages. BOOK/DJ: As NewFORMAT:SoftcoveISBN: 0410120129SKU: 0410120129A Christian based fantasy novel for ages 10 up. 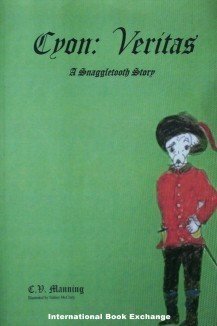 The possibilities for excitement in the land of Cyon seem nearly boundless for two newly retired soldiers and best friends: Captain Gustavius Snaggletooth - a small, debonair Maltese with madly misalleged teeth; and Sergeant Oslo Redbone - a massive Doberman known as a soldier's soldier. Setting out on the first day after their retirement from the bodyguard of King Leopold II, the friends find adventure even easier to come by than they had expected. It fact, it seems that adventure may be impossible to avoid.Visit my eCRATER Store for other great books and save on shipping! FREE DOMESTIC SHIPPING on orders over $25 when you buy other eligible items!All prices are in US dollars We use actual photos when possible We receive books from many sources and cannot guarantee against pet, perfume, or smoke smells. If this is a concern please email and we will be glad to check. The information provided by MUZE is not always correct. If there are any differences, our input is the correct information. DOMESTIC SHIPPING: Most shipping is by Media mail with delivery confirmation. Discounts available for multiple books that are paid for in one transaction. Priority and Express mail available. INTERNATIONAL SHIPPING: International buyers need to contact me for final costs before making payment. Buyer is responsible for all customs and duties. International shipments may take several weeks for transit and customs.Pay me securely with any major credit card through PayPal!